If you happen to be in Venice, Italy between June and November, you will see art everywhere…strange art, really ugly art, and beautiful, take-your-breath-away art! Art is in the museums, the palazzos, the canal-fronted warehouses, small intimate gardens! It’s everywhere! 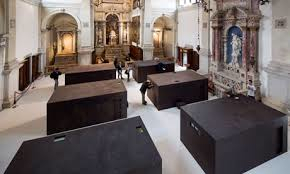 The Venice Biennale, one of the most prestigious contemporary art shows in the world is happening! Artists from 88 countries are presenting sculpture, painting, video, installation, performance…all the art you can imagine. But, alas, some of us can’t make it to Venice. 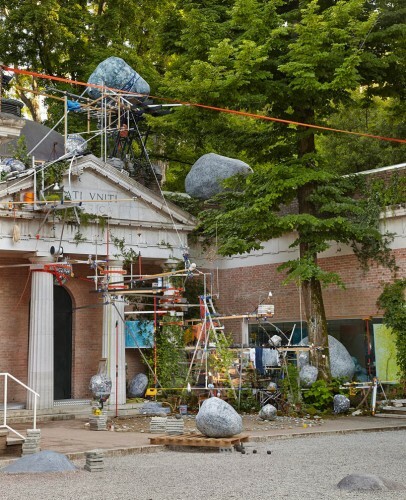 American artist, Sarah Sze, shows “Triple Point”, a huge and wild collection of found objects from ladders and paint cans to scraps of paper. Sze has wrapped Venice’s ancient buildings with these objects. It is startling. It’s ethereal. Political art is alive and kicking at the Biennale! Ai Weiwei is China’s best known artist. Only he protests the abuses of the Chinese government and Beijing officials don’t like him a bit. In 2011, the Chinese condemned Ai’s art, burned his studio and held him in a secret prison for 81 days. Ai wasn’t allowed to travel to Venice after his release from prison, so he clandestinely made his art pieces, then quietly transported them out of China to Venice. The art work features six imposing steel boxes. The boxes have narrow slits in the windows, through which visitors peek privately onto eerily life-like scenes of robotic officers, dirty bathrooms and bleak food. A re-enactment of Ai’s 81 day detention. 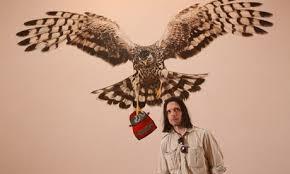 British artist, Jeremy Deller, takes aim at the royals and the wealthy. This audacious artist zeroes in on a scandal in Britain in 2007. Prince Harry and a mate were out a-hunting on one of the royal estates and “maybe accidentally” shot two endangered birds…hen harriers. Although the caper couldn’t be proven, the British press had a merry old time with the story. The cheeky Deller fills one wall at the Biennale with a huge mural of one of the owl-like birds clutching a miniature Land Rover in its talons. As for the Land Rover, it is the object of the bird’s revenge, and Deller’s swipe at the haughty who ride them, particularly on London roads where he cycles. Watch this video to see more art in Venice! Click here if unable to view the video. Nice and thought provoking, per usual. Thank you. Hi Kirby. Interesting as usual but also timely. I hope to be in Italy this fall. Because of your description, I will make every effort to visit Venice and the Biennale. I have no particular fondness for contemporary art, but in the setting of Italy, Venice and the romance of life, my perspective could change. My destination is Tremosine located on Largo de Garda, the birth place of my Mother. Its appeal is based upon the beauty of the surrounding Dolomites and serenity. Never before seen by me, it will be an opportunity to further connect with my heritage. I cannot imagine a more enjoyable vacation than sightseeing in Venice with you, Kirby. Just think of fun we would have – the food we would taste, the art we would savor and the unexpected adventures we would find ourselves in.